I am always eager for summer. A time when my children are all back home and the front door swings wildly with their friends. It is inevitable that the counter in my bar will be filled with sun burnt faces and growling stomachs. They all await some type of delicious snack whether it’s a cookie from the cookie jar or a freshly squeezed glass of iced cold lemonade. 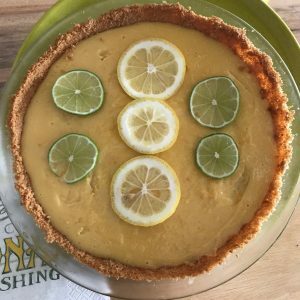 Summer truly is a time to slow down and enjoy the little things like picking these lemons from our backyard tree and carefully zesting each one for the delightful tartness of the Lemony Pie. Another great thing about this pie is that by following the recipe you get a delicious homemade dessert right out of your oven! 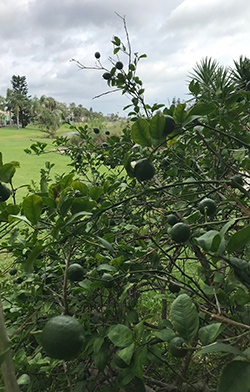 Not only does my backyard abound with lemons but also tiny avocados which I carefully observe for signs they are ready to be picked. My son planted a garden rich with radishes, squash, cucumbers and beans and the Florida sunshine and afternoon rains make for daily changes to each plant. This in turn transfers to vibrant conversations over our shared cups of coffee in the morning. With a little bit of investment you too can have a summer rich with lemons for you to grow and harvest and then reap their endless bounties! 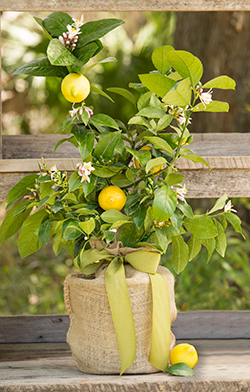 These little Meyer lemon trees grow relatively fast and will produce lemons in the first and second year of planting. Take a look at the picture of my tree in the backyard. It is five years old and produces between 50 and 80 lemons each season!!! The Meyer is known as a culinary delight with sweet skin for zesting and a large amount of juice in each lemon. An amazing summer delight! Lemon Pie with a delightful tartness! Pulse vanilla wafers and almonds in food processor until crumbly. Add melted butter and pulse again until combined. Press into a 9-inch pie plate. Bake at 350 for 12-15 minutes or until lightly browned. Cool completely. Whisk all ingredients in medium sized bowl until fully combined. Poor filling into cooled crust and bake between 15-17 minutes. Beat cream until stiff peaks form. Gradually sprinkle in sugar and then fold in lemon zest. Slice chilled pie and serve with your homemade whipped cream. Nothing tastes better than a pie made completely from scratch!